Visiting artist Brenda Garand poses for a portrait in her Chautauqua studio Monday at the School of Art. Garand is a sculptor and professor at Dartmouth College. On one of sculptor Brenda Garand’s many trips to the province of Quebec, she spent time in Tadoussac, where a merchant and French navy captain acquired a fur trade monopoly. Oral history and the legend of a place interest Garand; she said most of her ideas for her sculptures come from a psychological sense of history and a physical sense of place. Garand grew up as one of seven kids raised by a harried stay-at-home mother; her father was a carpenter and a shepherd who managed more than 2,000 sheep on Martha’s Vineyard. She has a mixed heritage, including English, French Canadian and the Abenaki tribe of Native Americans. For the last 18 years, Garand has conducted what she calls “visual research” throughout Quebec. 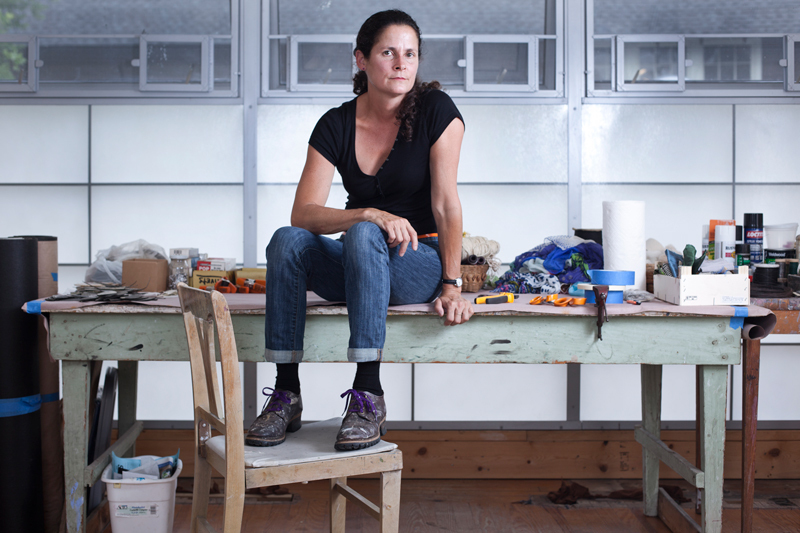 Garand speaks at 7 p.m. tonight in the Hultquist Center as part of the Visual Arts at Chautauqua Institution Visual Arts Lectures Series, and she plans to share slides of her sculptures. She uses materials like steel, roofing paper, wire, wool and silk to suggest a sense of history, place and space. Garand also plans to talk about some of her drawing. When she’s preparing for her sculptures, which she describes as “abstraction from realism,” she makes thumbnail-size sketches based on her inspiration. Garand said she has a lot of new work to show at Chautauqua. She served as a visiting artist at the School of Art in 2005. In the years since, she has chaired the art department at Dartmouth College, which required her to teach classes during the summer. As she returns to the School of Art this season, she hopes to teach students how to keep their work going over time. She plans to work on her drawing and on a small sculpture while she’s on the grounds.